For nutrients and additives, proper dosing procedures need to be applied in order to obtain maximum performance. ● Seedling phase: This phase begins when seeds or clones are first “planted”. It continues until a significant root system has developed and at least a few leaves have formed. Seedlings are grown in a dedicated propagation unit then transferred into a bigger system for the vegetative phase. ● Vegetative (or “growth”) phase: Further foliage and root development occurs during this phase. Strong vegetative growth in the plant is needed in this phase in order for there to be a successful flowering phase. ● Flowering (“bloom” or “fruiting”) phase: The flowering phase essentially begins when floral buds start to form and continues until harvest. Step 1. Fill nutrient reservoir with water: Add the majority of water before the nutrients and additives. For recirculating systems, allocate at least 10 litres (2.5 gal) for each large plant (e.g. tomato), or at least 2 litres (½ Gal) for each small plant (e.g. lettuce). These volumes will help minimize changes in nutrient concentration (EC) and pH. In hot weather, insufficient nutrient volume could result in EC getting too high, resulting in leaf burn. Larger nutrient volumes will also reduce how frequently top-up water is needed. ● Choose the necessary nutrients and additives based upon which phase of growth the plants are in - see section above. ● The dose rate depends upon factors such as the type of medium, plant type and the phase of growth. Refer to the manufacturers label for this information. ● Always add nutrients and additives separately. Never premix them. For example, with 2 and 3-part nutrients, the “parts” are kept separate for good reason. When these parts are mixed together in a concentrated form (or in too little water), a white precipitate will be produced (Fig 9.1). ● Stir well after adding each nutrient and additive. Step 3. Immediately check pH: Once all nutrients and additives have been added, immediately check pH and adjust if necessary. Maintain pH between 5.0 and 6.5 using pH Up or Down. For recirculating systems, check pH daily. Step 4. Feed frequency and volume: Refer to Table 9.20. Step 5. Maintaining nutrient concentration (For recirculating hydroponic systems only): As plants grow they simultaneously remove both water and nutrients from the solution. Ensure the water level is kept relatively constant. When this is done, the concentration (EC*) will be relatively predictable. It will move up or down depending upon the size and growth rate of plants and the salinity of the top-up water. *See Table 11.30. ● High pH additives: The best dosing technique to adopt with additives that increase pH significantly (e.g. silica and PK additives) is to add them to the water and adjust the pH down to ~6 prior to adding the nutrient. If the nutrient has already been added, pre-dilute the additive in a separate volume of plain water. After this solution is added to the nutrient solution, immediately lower the pH to below 6.5. A white ‘cloudy’ precipitate (calcium sulfate) may form where the pre-diluted additive initially merges with the nutrient solution. 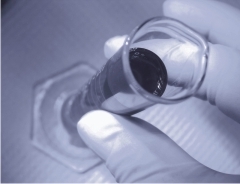 However, because the initial particle size of the precipitate is small, it will rapidly re-dissolve if the pH is immediately re-adjusted (Fig 9.2a). 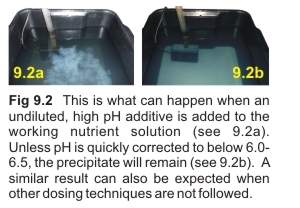 For those additives that lower pH, it is satisfactory to add them to the nutrient solution without pre-dilution. ● 2 & 3-part nutrients: Accurately measure out the dose. In the case of a 2-part, 'under' dosing part 'B' for example, could cause a deficiency in over half the nutrients required (i.e. P, K, S and all of the trace elements - except iron).